The Digirout 1000 Rotary Lathe Axis allows CNC lathe machining of stock up to the travel length of the machine. The picture above shows the construction of the lathe axis. 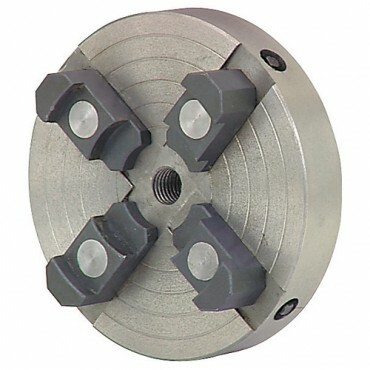 A standard lathe adjustable wood chuck is mounted to the precision vertical rotary table. The worm gear drive provides a 36:1 gear reduction. The timing belt reduction provides a further 3:2 gear reduction which is driven by a nema 34 motor & microstepping drive (Servo motor and drive also available for additional charge). The rotary table is mounted to a 3"x5"x.25" steel angle for mounting to the router table surface. A tailstock with dual .75" spherically adustable mounted radial bearings allows lathe machining of parts up to the travel length of the Digirout 1000 . Base Dimensions: 4 1/8" x 3 1/4"
Center Height in Vertical Position: 1 1/2"
Hand Wheel calibrated to 10 degrees per revolution with 1/4 degree increment graduations. Table scale graduated in 5 degree increments. Durable chuck is constructed of one piece cast alloy steel.